“Due to the circumstances that arose, and the fact that WhatsApp Inc issued a cease and desist letter to WhatsApp+, the official WhatsApp+ community is shutting down for good and will be removed by the end of the day,” reads the statement, which was posted on Wednesday. So why is WhatsApp so miffed by this service? Well, for one, it claims that these third-party services can’t be trusted with user information. It’s a problem other services — like Snapchat — have run into before. Reports surfaced in mid-October that thousands of Snapchat photos were leaked via third-party Snapchat apps. So concerns about security risks aren’t unwarranted at all. 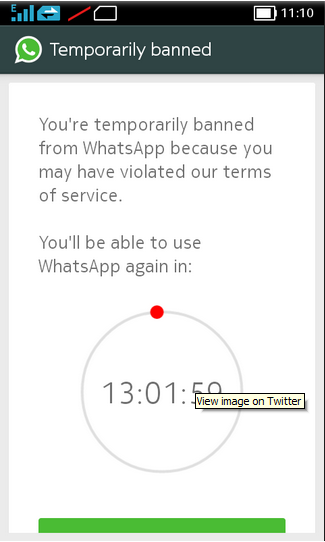 As well as the action it’s taking against third-party apps, WhatsApp is also temporarily banning people who use them. The bans usually last 24 hours, and once the countdown ends, users can use the application again. Some, of course, expressed frustration about the situation on social media.